Today I stumbled upon the following article. I encourage you to read the article, but for brevity I will sum it up. Basically, when creating a for loop in most C-based languages, there are two basic incrementation operators: Pre-increment (++i) and Post-increment (i++), with Post-increment being by far more common. From a functional standpoint, in C# they are equivalent within a loop and always produce the same output. The premise of the article is that while Post-incrementing is recommended by most computer science professors, due to it’s implementation in the ECMA standards it is actually slower than Pre-incrementation. 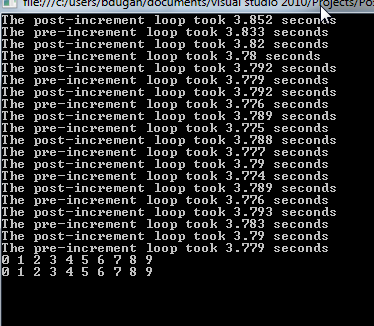 While there is a measurable difference between the two operators, it is so minute that over the course of 1 billion iterations it only amounted to .02 seconds difference on average on my machine. In a loop used in an every day program, this would most likely make no measurable difference. Although the difference was minute, I may still start using the Pre-increment operator since it is such a small change. Tagged Art of Programming, C#, CSharp, Science!